موذن زاده, روزبه. (1395). بررسی تأثیر عدم قطعیت ناشی از ضریب تصحیح رطوبتی خاک در برآورد تبخیر- تعرق واقعی. نشریه آبیاری و زهکشی ایران, 10(4), 454-465. روزبه موذن زاده. "بررسی تأثیر عدم قطعیت ناشی از ضریب تصحیح رطوبتی خاک در برآورد تبخیر- تعرق واقعی". 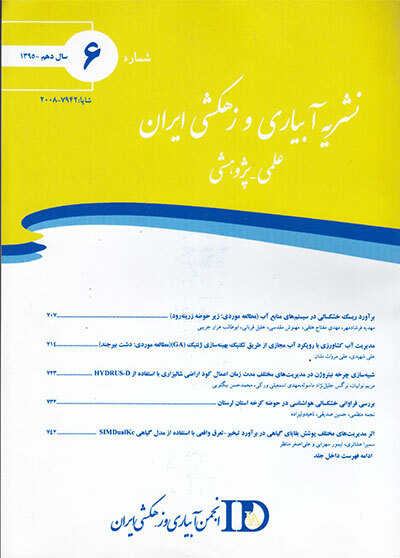 نشریه آبیاری و زهکشی ایران, 10, 4, 1395, 454-465. موذن زاده, روزبه. (1395). 'بررسی تأثیر عدم قطعیت ناشی از ضریب تصحیح رطوبتی خاک در برآورد تبخیر- تعرق واقعی', نشریه آبیاری و زهکشی ایران, 10(4), pp. 454-465. موذن زاده, روزبه. بررسی تأثیر عدم قطعیت ناشی از ضریب تصحیح رطوبتی خاک در برآورد تبخیر- تعرق واقعی. نشریه آبیاری و زهکشی ایران, 1395; 10(4): 454-465. از آنجا که مقدار قابل توجهی از بارندگی در حوضه­های آبریز با کاربری کشاورزی صرف تبخیر- تعرق می­گردد، بنابراین عامل مذکور نقش مهمی در بیلان آب و مدیریت منابع آب ایفا می­نماید. بنابراین برآورد صحیح این مولفه بسیار حائز اهمیت است. الگوریتم توازن انرژی در سطح زمین (سبال) یکی از روش­های برآورد تبخیر- تعرق واقعی می­باشد که بر مبنای تکنیک سنجش از دور استوار است. در ساختار الگوریتم مذکور از شاخص­ها و ضرایب تجربی مختلفی استفاده می­شود که هر کدام در برآورد تبخیر- تعرق واقعی موثر می­باشند. در این تحقیق تاثیر عدم قطعیت ناشی از مقادیر شاخص تعدیل خاک، پوشش گیاهی در قالب الگوریتم سبال، بر روی برآورد مقادیر تبخیر- تعرق واقعی در بخشی از حوضه­ی آبریز نیشابور مورد بررسی قرار گرفت. به­منظور تعیین مقدار بهینه­ی شاخص مذکور از تصاویر ماهواره­ای سنجنده­ی مودیس در سال­های 1392 و 1393 استفاده شد و تاثیر عدم قطعیت ناشی از مقادیر مختلف این شاخص بر روی برآورد مقادیر تبخیر- تعرق واقعی در سال 1393 مورد بررسی قرار گرفت. مقایسه­ی مقادیر برآوردی تبخیر- تعرق و مقادیر اندازه­گیری شده­ی میکرولایسیمتری آن در پلیگون مورد بحث نشان داد که کم­ترین و بیش­ترین خطای برآورد تبخیر- تعرق به­ترتیب به ­ازای مقدار 2/0 (RMSE=0.07، R2=0.99) و یک (RMSE=0.6، R2=0.12) برای ضریب L در ساختار شاخص تعدیل خاک پوشش گیاهی به­دست آمد. هم­چنین نتایج آزمون تی تست اختلاف معنی­داری در سطح 95 درصد (p<0.05) بین مقادیر اندازه­گیری و برآورد شده­ی تبخیر- تعرق واقعی برای تمامی مقادیر ضریب L به جز مقدار 2/0 را نشان داد. Since a significant amount of precipitation in the agricultural watersheds is used by evapotranspiration, so this parameter plays an important role in water budget and water resources management. Therefore, accurate estimation of this component is very important. SEBAL (Surface Energy Balance Algorithm for Land) belongs to the methods of estimating the actual evapotranspiration (ETact) which is based on remote sensing technique. In the structure of this algorithm several indices and empirical coefficients are used, each of them is effective for estimating actual evapotranspiration. In this study the effect of the uncertainty caused by the soil adjusted vegetation index (SAVI) values in the form of SEBAL algorithm was investigated on ETact prediction on the part of Neyshabour watershed. To determine the optimize value of SAVI, 2013 and 2014 MODIS satellite images were used and the effect of SAVI values uncertainty on ETact prediction was discussed in 2014. Comparison between estimated values and microlysimeter measurements of ETact in the discussed polygon showed that the minimum and maximum error of ETact estimation has been obtained for the amount of 0.2 (R2=0.99, RMSE=0.07) and 1 (R2=0.12, RMSE=0.6) for L coefficient in the SAVI index structure. The results of t-test also showed the significant differences at 95% (p<0.05) between measured and predicted values of ETact, using the whole rangeof L coefficient, except 0.2. حسن پور،ب.، میرزایی،ف.، ارشد،ص و کوثری،ه. 1391. مقایسه الگوریتم­های SEBAL و S-SEBI در برآورد تبخیر و تعرق در منطقه کرج. نشریه آب و خاک، 26 .6: 1360-1371. خاوریان نهزک،ح. 1383. برآورد تبخیر و تعرق با استفاده از تصاویر سنجنده MODIS. پایان­نامه کارشناسی ارشد، دانشکده علوم انسانی، دانشگاه تربیت مدرس تهران. قمرنیا،ه و رضوانی،س. 1393. محاسبه و پهنه­بندی تبخیر- تعرق با استفاده از الگوریتم سبال (SEBAL) در غرب ایران (دشت میان­دربند). نشریه آب و خاک. 28. 1: 72-81. مکاری،م.، قهرمان،ب و ثنایی نژاد،س.ح. 1394. بهینه کردن شاخص SAVI و برآورد تبخیر- تعرق واقعی با استفاده از تصاویر ماهواره­ای لندست 8، نشریه آبیاری و زهکشی ایران. 3. 9: 459-469. مهندسین مشاور سازآب شرق. 1392. مطالعات بهم پیوسته منابع آب حوضه نیشابور، گزارش­های هواشناسی، هیدرولوژی و خاک­شناسی، مشهد. Allen,R.G., Tasumi,M., Trezza,R., Waters,R and Bastiaanssen,W.G.M. 2002. SEBAL: Surface Energy Balance Algorithms for Land, Advanced Training and Users Manual. Version 1.0. 1-98. Bastiaanssen,W.G.M. 2000. SEBAL-based sensible and latent heat fluxes in the irrigated Gediz basin, Turkey. Journal of Hydrology. 229: 87-100. Bastiaanssen,W.G.M., Molden,D.G and Makin,I.W. 2000. Remote sensing for irrigated agriculture: examples from research and possible applications. Agricultural water management. 46: 137-155. Bausch,W.C. 1993. Soil background effects on reflectance-based crop coefficients for corn. Remote Sensing of Environment. 46: 213-222. Gebremichael,M., Wang,J and Sammis,T.W. 2010. Dependence of remote sensing evapotranspiration algorithm on spatial resolution. Atmospheric research. 96: 489-495. Gonzalez Dugo,M.P., Neale,C.M.U., Mateos,L., Kustas,W.P., Prueger,J.H., Anderson,M.C and Li,F. 2009. A comparison of operational remote sensing-based models for estimating crop evapotranspiration. Agricultural and Forest Meteorology. 149: 1843-1853. Green,C.H and Griensven,A.V. 2008. Autocalibration in hydrologic modelling: Using SWAT 2005 in small-scale watersheds. Environmental modelling and software. 23: 422-434. Karatas,B.S., Akkuzu,E., Unal,H.B., Asik,S and Avci,M. 2009. Using satellite remote sensing to assess irrigation performance in Water User Associations in the Lower Gediz Basin, Turkey. Agricultural Water Management. 96: 982–990. Moriasi,D.N., Arnold,J.G., Van Liew,M.W., Binger,R.L., Harmel,R.D and Veith,T. 2007. Model evaluation guidelines for systematic quantification of accuracy in watershed simulations. Transactions of American Society of Agricultural and Biological Engineers. 50.3: 885-900. Mu,Q., Heinsch,F.A., Zhao,M and Running,S.W. 2007. Development of a global evapotranspiration algorithm based on MODIS and global meteorology data. Remote Sensing of Environment. 111: 519–536. Mutiga,J.K., Su,Z and Woldai,T. 2010. Using satellite remote sensing to assess evapotranspiration: Case study of the upper Ewaso Ng'iro north basin, Kenya. International Journal of Applied Earth Observation and Geoinformation. 125: S100-S108. Rondeaux,G., Steven,M and Baret,F. 1996. Optimization of soil-adjusted vegetation indices. Remote Sensing of Environment. 48: 119-126. Rwasoka,D.T., Gumindoga,W and Gwenzi,J. 2011. Estimation of actual evapotranspiration using the surface energy balance system (SEBS) algorithm in the upper Manyame catchment in Zimbabwe. Physic and chemistry of the earth. 36: 736-746. Shu,Y., Stisen,S., Jensen,K.H and Sandholt,I. 2011. Estimation of regional evapotranspiration over the North China Plain using geostationary satellite data. International Journal of Applied Earth Observation and Geoinformation. 13: 192–206. Sun,Z., Wang,Q., Matsushita,B., Fukushima,T., Ouyang,Z and Watanabe,M. 2009. Development of a simple remote sensing evapotranspiration model (Sim-ReSET): Algorithm and model test. Journal of Hydrology. 376: 476-485.